When our embarrassments and fears lie, we often listen to them anyway. They thwart our gratitude, acceptance, and compassion--our goodness. They insist, "I am not worthy." But we are worthy--of self-discovery, personal growth, and boundless love. With Brené Brown's game-changing New York Times bestseller The Gifts of Imperfection--which has sold more than 2 million copies in more than 30 different languages, and Forbes recently named one of the "Five Books That Will Actually Change Your Outlook On Life"--we find courage to overcome paralyzing fear and self-consciousness, strengthening our connection to the world. 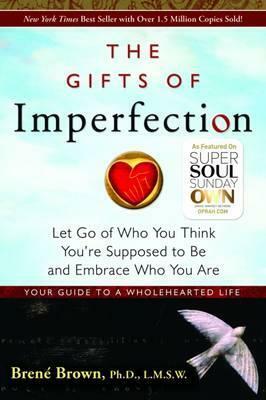 A motivational and inspiring guide to wholehearted living, rather than just the average self-help book, with this groundbreaking work Brené Brown, Ph.D., bolsters the self-esteem and personal development process through her characteristic heartfelt, honest storytelling. With original research and plenty of encouragement, she explores the psychology of releasing our definitions of an "imperfect" life and embracing living authentically. Brown's "ten guideposts" are benchmarks for authenticity that can help anyone establish a practice for a life of honest beauty--a perfectly imperfect life. Now more than ever, we all need to cultivate feelings of self-worth, as well as acceptance and love for ourselves. In a world where insults, criticisms, and fears are spread too generously alongside messages of unrealistic beauty, attainment, and expectation, we look for ways to "dig deep" and find truth and gratitude in our lives. A new way forward means we can't hold on too tightly to our own self-defeating thoughts or the displaced pain in our world. Instead, we can embrace the imperfection. "Brene Brown courageously tackles the dark emotions that get in the way of leading a fuller life; read this book and let some of that courage rub off on you." "Courage, compassion, and connection: Through Brene's research, observations, and guidance, these three little words can open the door to amazing change in your life." Dr. Brené Brown is a research professor at the University of Houston where she holds the Huffington Foundation--Brené Brown Endowed Chair at The Graduate College of Social Work. She has spent the past two decades studying courage, vulnerability, shame, and empathy and is the author of four #1 New York Times bestsellers: The Gifts of Imperfection, Daring Greatly, Rising Strong, and Braving the Wilderness. Her newest book is titled Dare to Lead: Brave Work. Tough Conversations. Whole Hearts. Brené's TED talk--The Power of Vulnerability--is one of the top five most viewed TED talks in the world with over 35 million views. Brené lives in Houston, Texas with her husband, Steve, and their children, Ellen and Charlie.